If I were a vegetarian, I’m not sure my boyfriend and I would get on in the kitchen. He is a true self-proclaimed carnivore and will never be happier than with a large rare steak for dinner. Although I eat meat (and when I do the rarer the better!) I have always been a champion of vegetables (I inherited this from my mum) – as well as being healthy, they are so colourful and varied and, well, tasty. Given my boyfriend’s predisposition, I am particularly proud of myself and almost feel a sense of cunning when I manage to sneak this sort of dish onto the table and be complimented on it (although he did say it would be nicer if it somehow incorporated bacon…I am ignoring this). It’s a little early for asparagus season so consider this a recce: when asparagus floods the shops in a few weeks and you’re bored of steaming it, try this quick* and simple tart. Perfect as a starter or a light supper, vegetarians and non-vegetarians alike will enjoy this. Crispy pastry, oozy feta and fresh asparagus punctuated with crunchy pine nuts – what’s not to like? Preheat your oven to 200°C. Roll out the puff pastry into a rectangle about 1/2 cm thick and place onto a baking tray lined with baking paper. To make the crust, score a border 1cm in from the edge (only partly cutting through your pastry) with a sharp knife. Prick the central square with a fork (this will stop it rising too much). Blind bake the pastry for 10 minutes to minimise the risk of a soggy bottom. Spread the creme fraiche onto the central square. Trim the asparagus to fit the width of the tart and arrange top-to-tail. Crumble the feta on top, sprinkle with pine nuts and drizzle with olive oil. Season with a few grinds of black pepper (I find that the feta brings ample saltiness to the dish). Bake for another 25 minutes or so until the pastry is golden brown and the asparagus is tender. Source: Recipe and photos by pip & little blue. 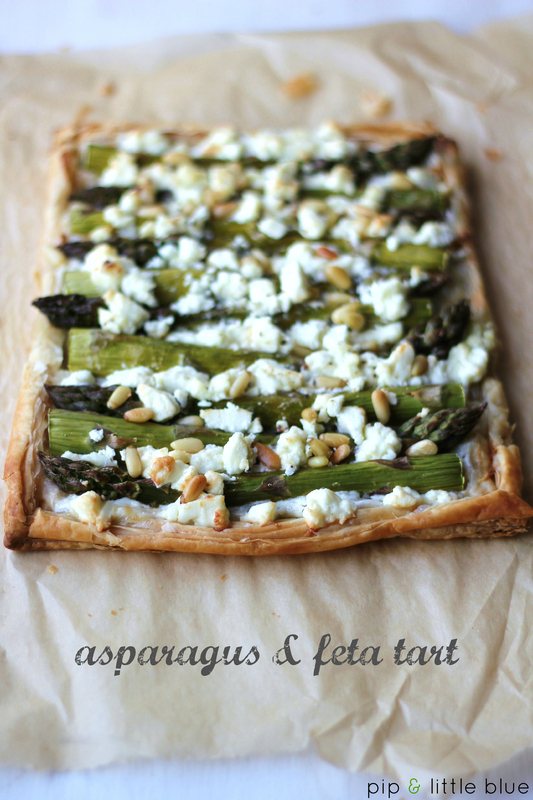 Tags: asparagus, easy, feta, midweek, picnic, puff pastry tart, recipe, vegetarian. Bookmark the permalink. Ate this last night and it was delish! I’m so glad you liked it, thank you!